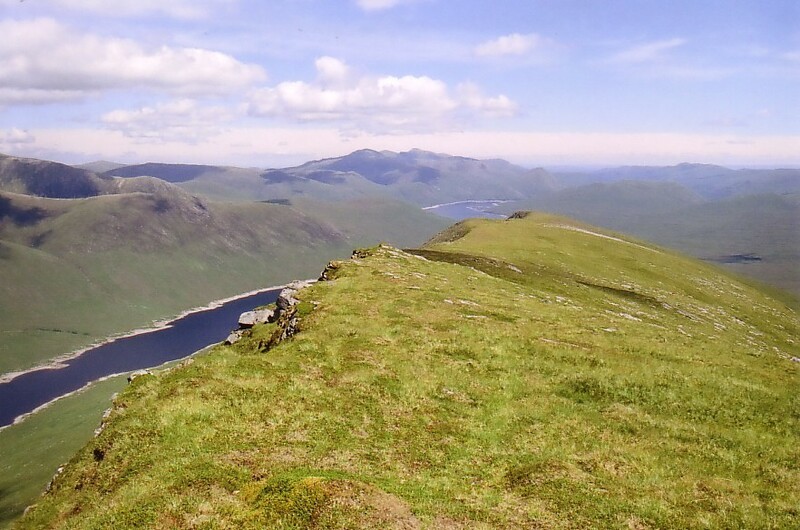 My second long, hard day of my July Munro Top-bagging trip… The weather was really hot, sticky and airless but some great views were to be had from the hill plus a visit past the lovely Pait Lodge down the desolate wilderness of far Loch Monar. After yet another superb night’s sleep at the Cannich camp site (see my recommendations page for details), I rushed around to get ready to drive to the locked gate at Struy which opens bang on 0900. As the glen opens to the public’s cars at that time and only lets 25 cars in for the day, you pretty much want to get there on time. Couple of exciting dams to drive across the top of! 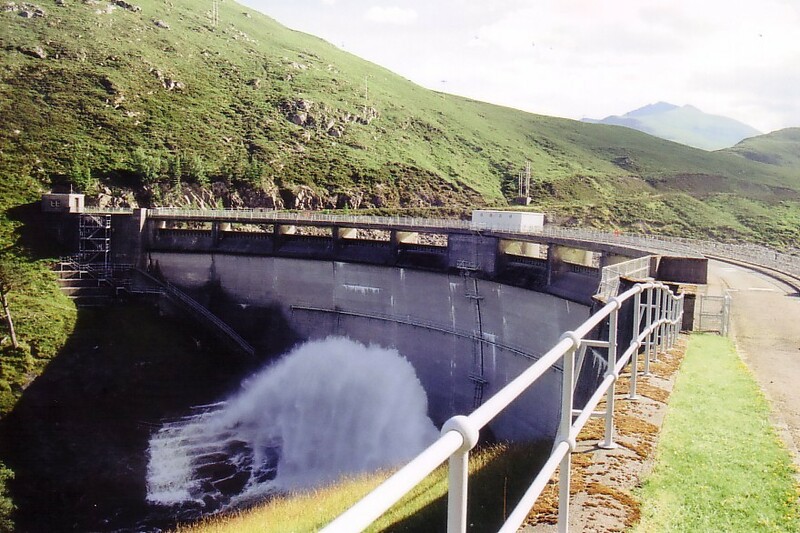 By the time I parked up at the Loichel Power Station at the road end and got kitted up, it was 0950 – that left me just a tad over ten hours to do my 18 mile walk and drive the 16 miles back down the glen. Cutting it pretty tight over rough and pathless terrain with a big hill thrown in and two walks over lower passes. 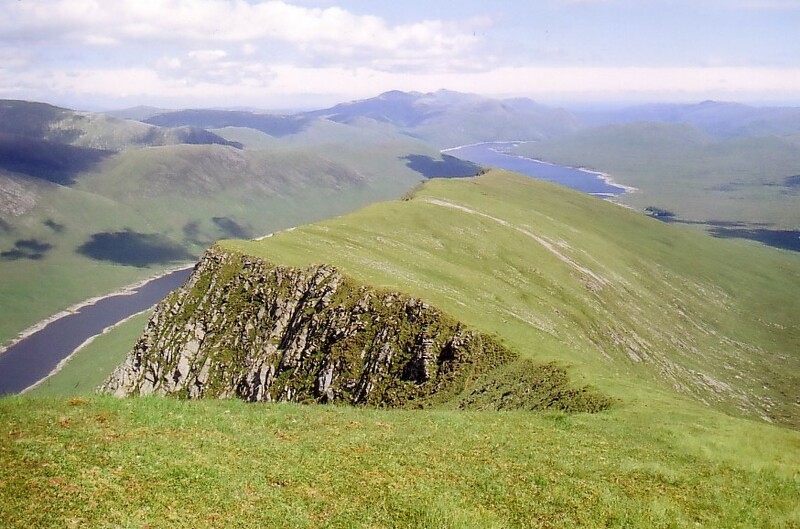 The day was by now very hot and there was no breeze whatsoever – I hoped there would be one on the hill but knew there wouldn’t be before I reached the high ridge of Meall Mor. 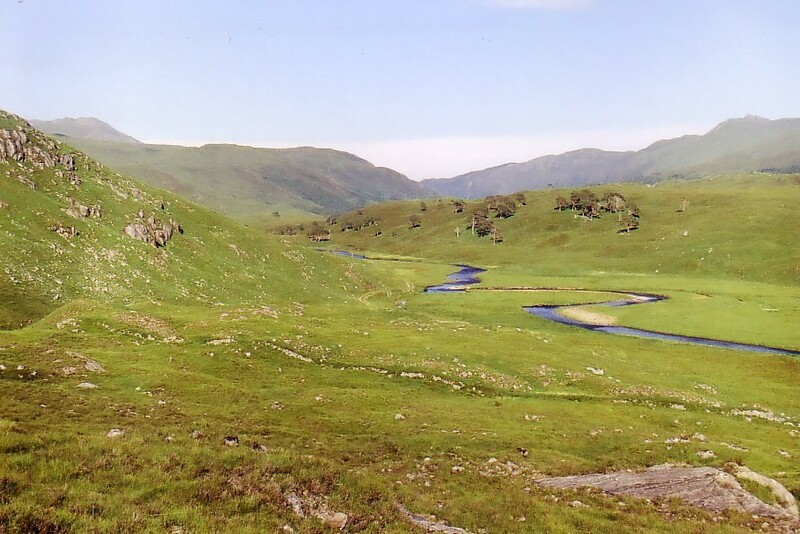 Although a lot of this walk is pathless over wild moorland terrain, there is at least a path for the first couple of miles up Gleann Innis an Loichel – I hurried up it already being harried by horseflies (clegs in Scotland). Walking in cleg territory unfortunately means that, no matter how hot it is, you can’t uncover any flesh as you will get very badly bitten – the bite sites usually swell up drastically and itch badly for at least a couple of weeks. 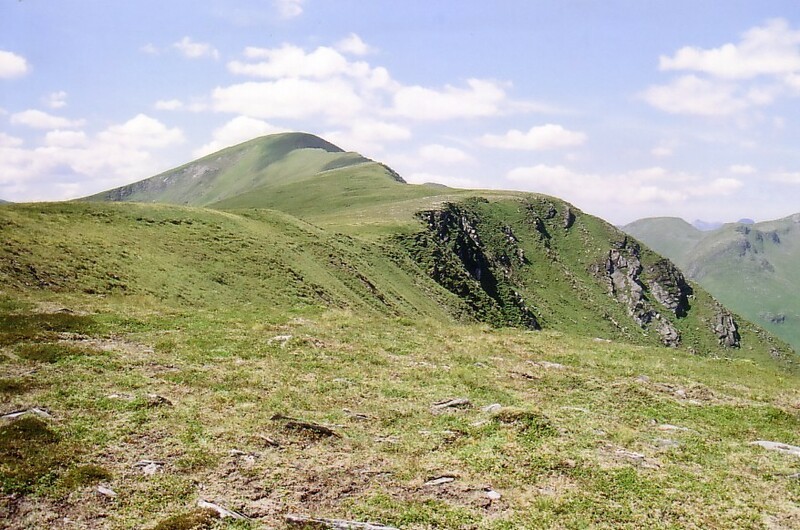 I had put long trousers on and kept my hiking socks pulled over them but refuse to have my arms totally covered up as then I would get far too hot walking – that meant I had to constantly wave my arms around to attempt to keep the clegs off – not much fun on a long and hard day. By the time I’d reached the end of the path up the glen, I’d got a couple of nasty bites already. 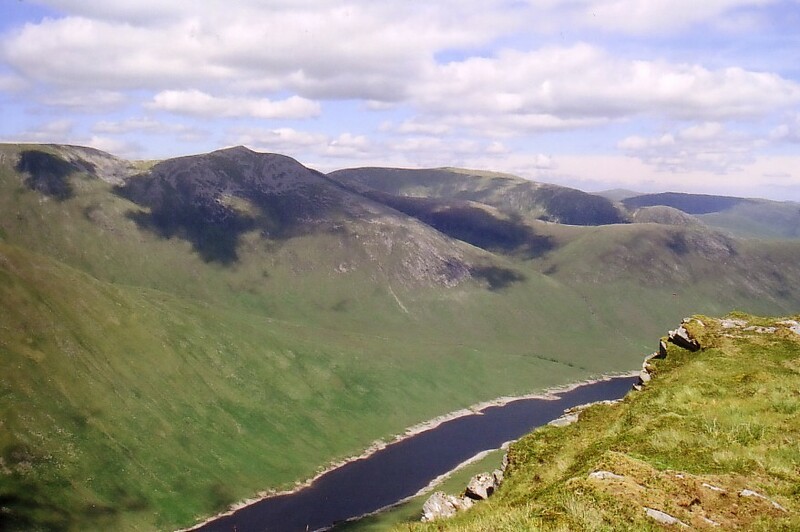 I then had a pathless plod up to a col between two peaks of Meallan Buidhe at around 1500 feet. It isn’t too far to climb from where the paths diverge and become faint and I was soon in the gap. I noticed the cairn of Meallan Buidhe wasn’t too far away but, after wistfully looking at it for a minute, I decided I couldn’t really add anything into my already long day with the time constraints I had. The descent to the burn went well and I soon located the track down the rest of the moorland to the lodge. On arrival at the lodge grounds there were various gates and I wasn’t sure whether I was allowed to continue through the grounds or not. I checked each gate and saw they had what I call ‘walkers fasteners’, i.e. easy hooked chains, so I assumed I was permitted to enter. I waited until the guy was out of sight around some bushes and hurried up the path to the lodge entrance where I could see another gate to the bridge. No-one yelled at me and I just had chance to see how pretty the lodge was (but unfortunately not get a photo) before I went to hurriedly tackle the gate to the bridge. Unfortunately for me, the hook was almost impossible to get out of its holder to release the gate and I ended up stood there pushing and pulling for ages, all the while expecting a shout behind me! I eventually got the hook to come undone (unusually, you have to push the gate slightly down and towards the gatepost – you usually have to lift or something). I had just as much trouble rehooking the gate but then hurried across the bridge. I only had my small flask of coffee and knew there wouldn’t be any water from this point on so had a good couple of flask cupfuls out of the burn to drink and soaked my buff to stick on my head to further cool me. 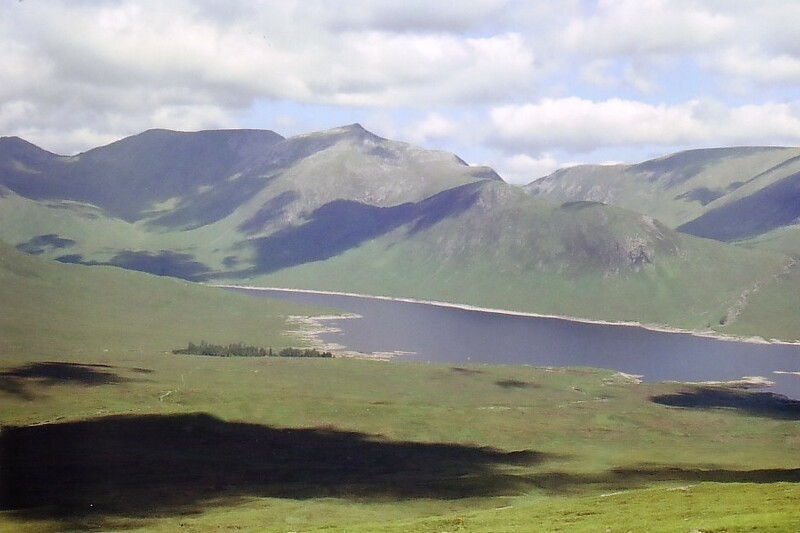 Then it was across the bogs and peat hags for the foot of the long slog up the side of the ridge to Meall Mor. It was quite a long and a very hot climb to the ridge and I tried to follow the dry burns up as the ground is generally easier there. The clegs became much worse up this section and added to the misery of the sweltering climb – ugh. They ended up following me all the way up to, and partway along, the ridge – very unusual for them to go so high. I decided this was because so few walkers come this way and so there is little blood to be got so they work harder for it here! 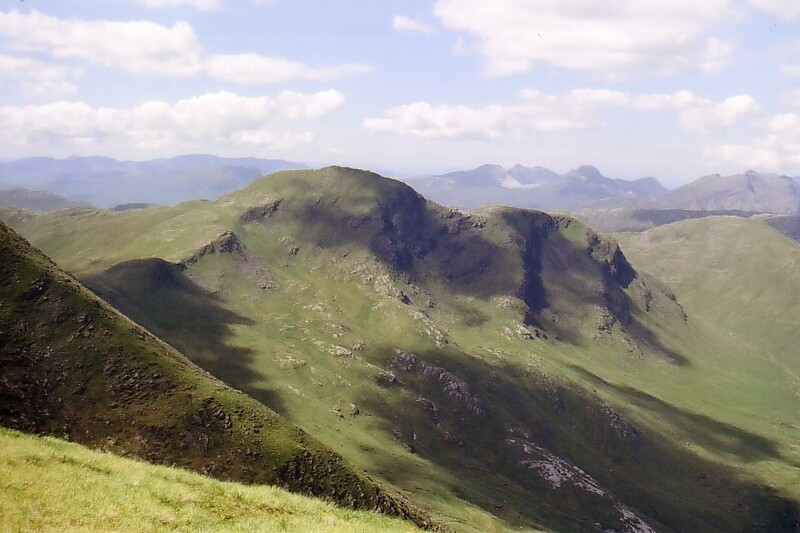 I eventually reached the ridge where I hoped there would be a breeze – there generally is. Unfortunately, there was still no breeze at all so I just had to make do with the lessening of the gradient and slog on. I continued along the ridge for quite a way without any real strain and with a sketchy path. Ahead were quite a few sharp rises – luckily, when I reached them, the path became quite good. 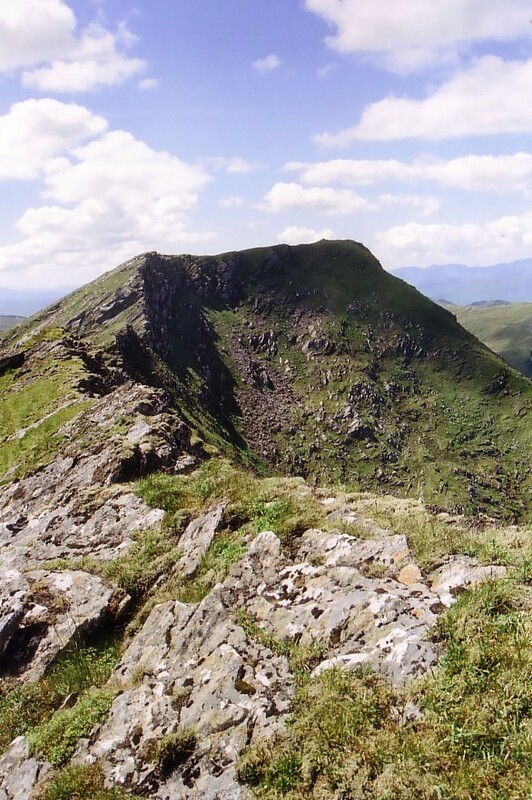 There was still the short but very steep final rise to the summit though – the sting in the tail! 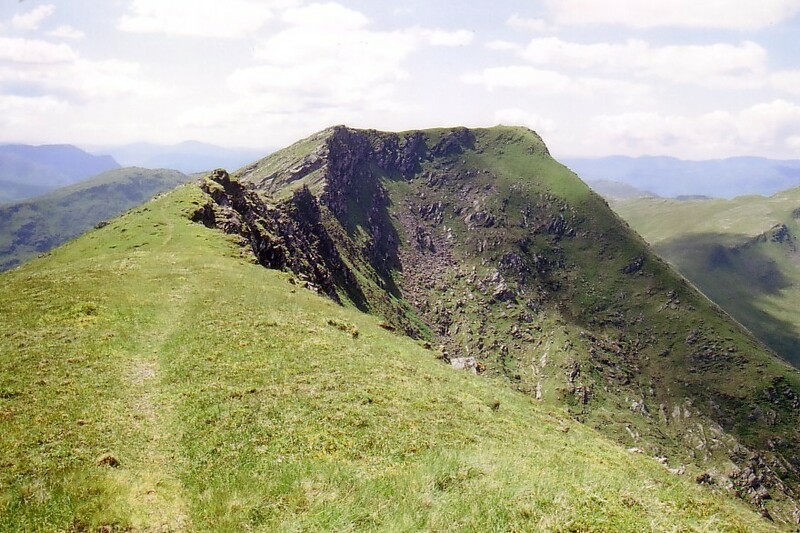 Near the end of the song the summit cairn hove into view on the rounded grassy summit. I continued past it after a brief touch of the stones though as I wanted to see where I’d turned back on my visit to Lurg Mhor – I’d known the traverse to Meall Mor was very ‘exciting’ and had chickened out of it in the mist and rain on the slippery rocks. When it came into view, I was pretty glad I’d turned back really – it looks quite mean! After a quick break on the summit for my first coffee of the day, I decided I wasn’t yet hungry and that I’d have another break in the breeze on the bridge by Pait Lodge. As I set off back along the ridge – very pleasant in descent – I noticed there was actually a breeze when going in that direction and it was much cooler. 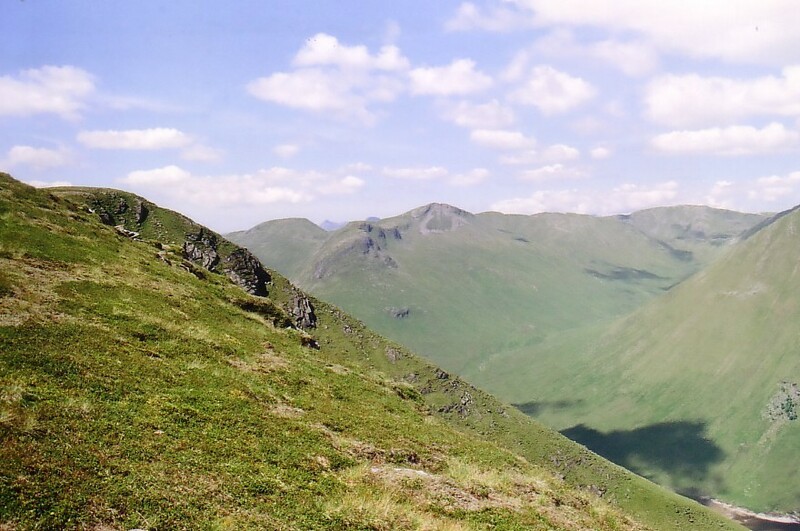 I happily sped back along the ridge, stopping occasionally to peer down the huge northern crags into the corries. I was surprised to see some deer relaxing in one corrie apparently completely surrounded by crags – I couldn’t see how they’d got where they had, nor how they would get back down! As I exited the perimeter of the lodge I noticed the ‘lady’ of the house was strolling down to the loch shore in wellies for a spot of fishing. 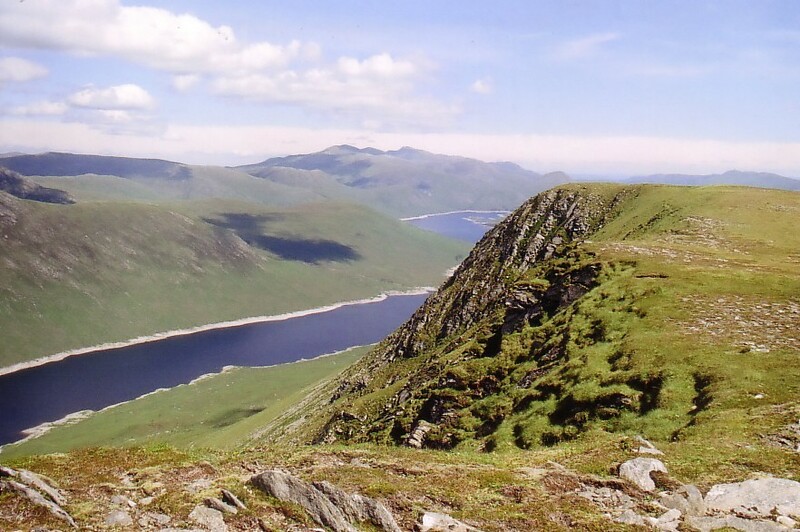 I’d decided also to go down to the loch shore as I couldn’t face the amount of pathless moorland ascent to reach the col I’d come over by Meallan Buidhe. 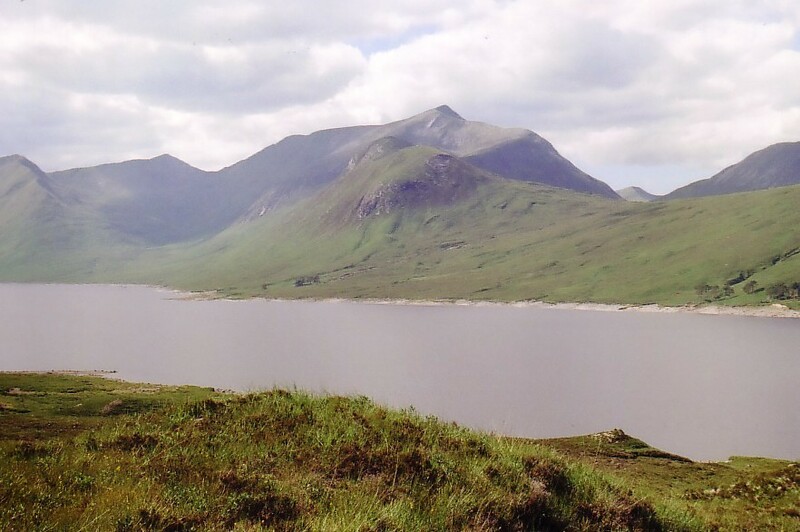 My return plan was to follow the loch shore for a couple of pathless miles to another low pass between Meallan Odhar and Beinn Dubh – that would take me almost straight down to the car and had the advantage of being some 600 feet lower than the outward pass. The pathless shoreline went much better than I expected (Loch Quoich’s is a nightmare!) 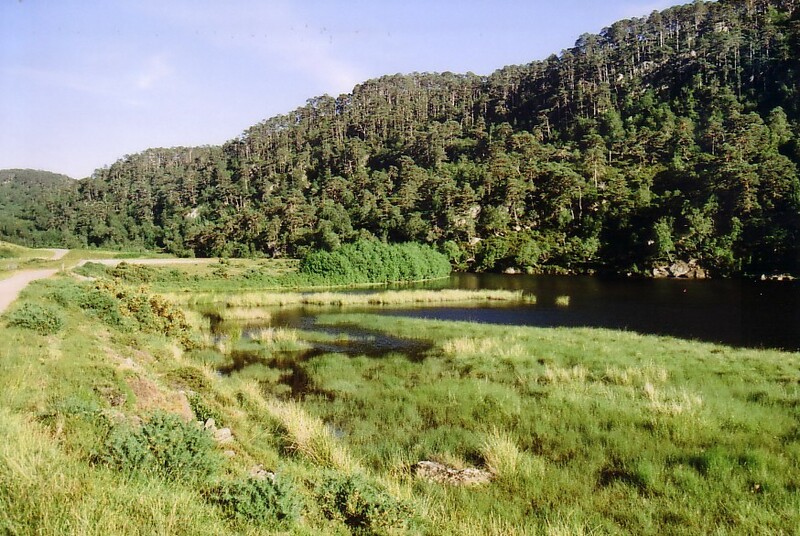 – there were a few burn crossings but, as the water levels were very low indeed, there was no problem with any of them. I was soon at the burn exit where I intended to head up over my moorland pass. 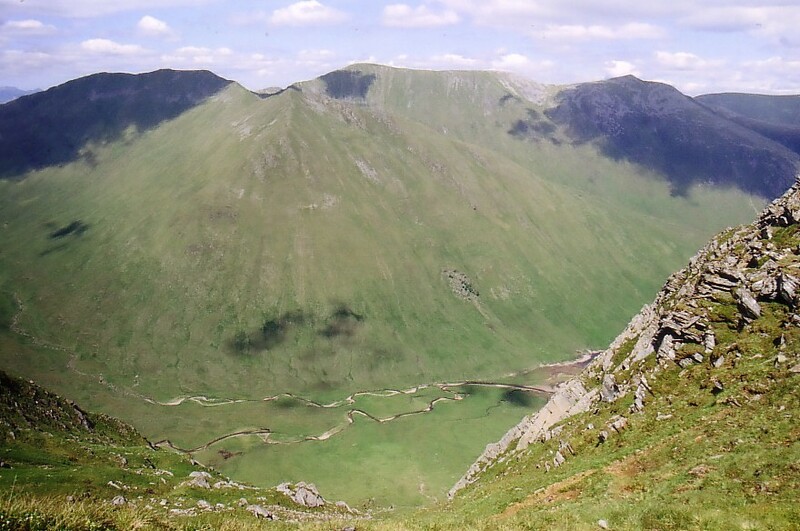 The Beautiful Bidean an Eoin Dearg – worth much more than ‘top’ status! 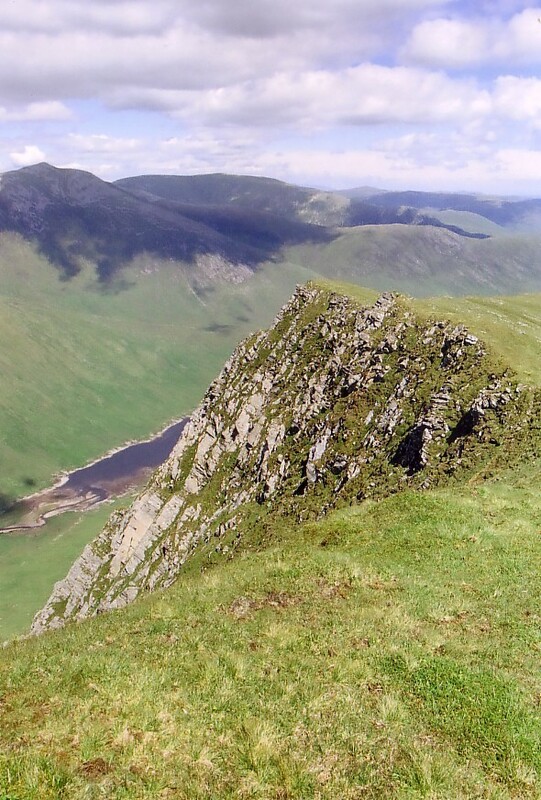 Luckily, although the ascent seemed very long, there was only one what I would call ‘heartbreaking rise’ and then I was crossing the long, level, peat-hagged pass. I knew there was a stalkers’ path at the far end of the pass which headed off back to Gleann Innis an Loichel and the car. 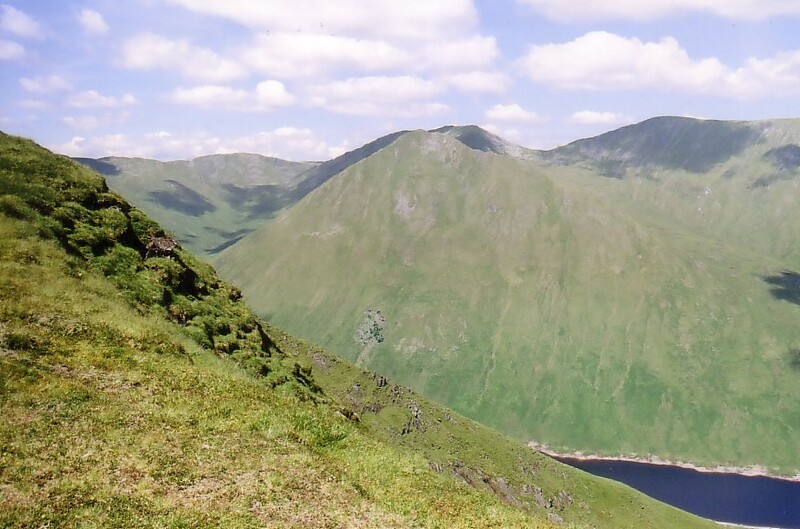 Although I was looking the wrong side of the glen for the path (for some reason I thought it was up to Beinn Dubh and not Meallan Odhar), I found a path coming down from Beinn Dubh which crossed the river and morphed into the stalkers’ path back down to the glen. Now I knew I was home and dry and, looking at my watch, with at least an hour to spare, I sat for a longer break to enjoy some of the sunshine and finish my flask. Unfortunately for me, the clegs decided that would be a great time to step up their harassment campaign and they moved me on much sooner than I was planning. Pretty soon, I felt ready for the long drive back down the glen. 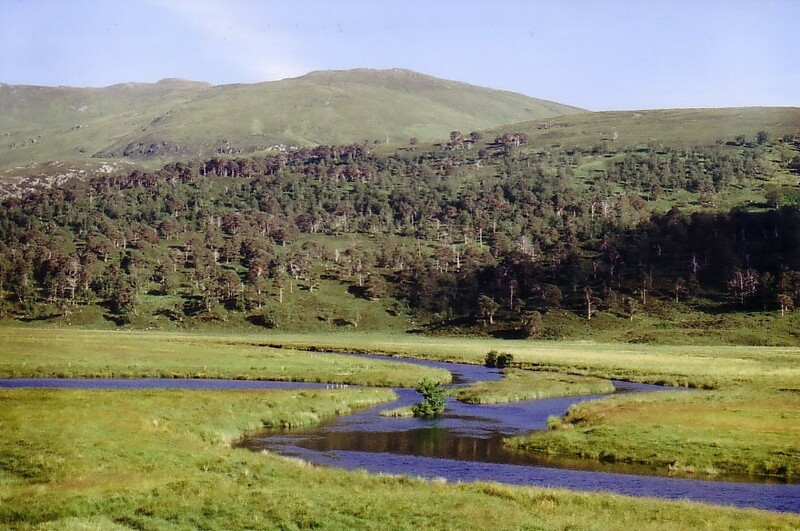 This time, as I didn’t know when I would be back, I resolved to stop often and take photos of the many beautiful vistas down the glen – Strathfarrar is a truly lovely place. Arriving back at my restful campsite, I was pleased to note that, for the first time this year, I wasn’t exhausted after my long day! 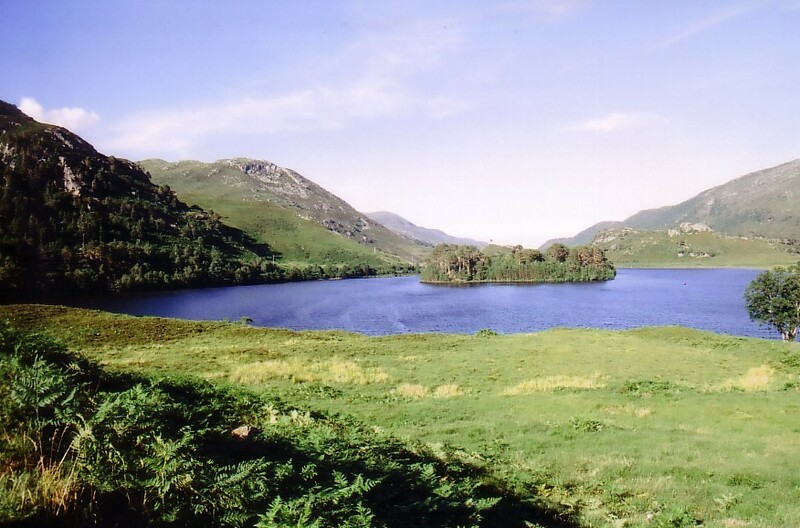 I am called after Loch Monar. Every year I stay in Pait Lodge. 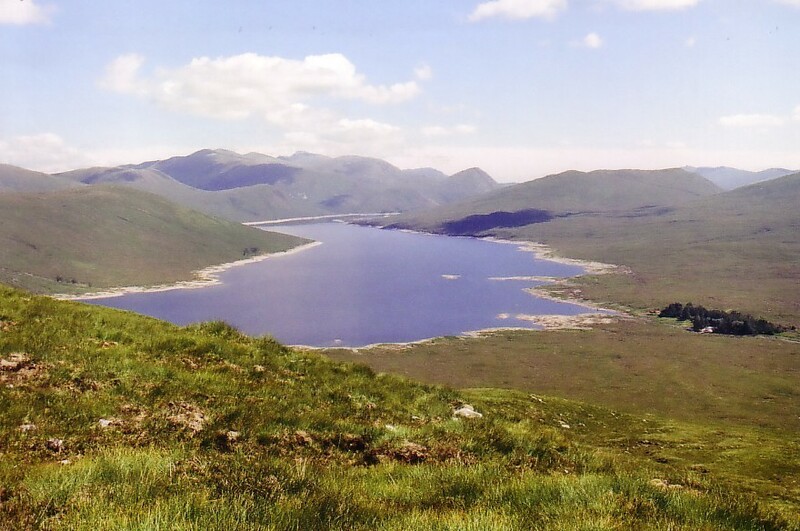 I think Loch Monar is just about my favourite Scottish loch – certainly my favourite area of Scotland. How come you visit Pait Lodge? I thought it was private? Missed this one too 😦 I seem to be getting so much spam recently everything gets lost in my inbox!! I’m sure it’s worth it to get such great shots. I had a similar experience to you in the glen a few years ago. The lady on the entrance gate was very nice but I felt pressured to get my walk done before it was locked at night. Plus, I had a run-in with a stalking party, and that blighted the day somewhat. But if I’d known there was a wet T-shirt display taking place near the power station I’d have brightened up a bit. Great post and photos Carol. I’ve only visited that glen a couple of times. 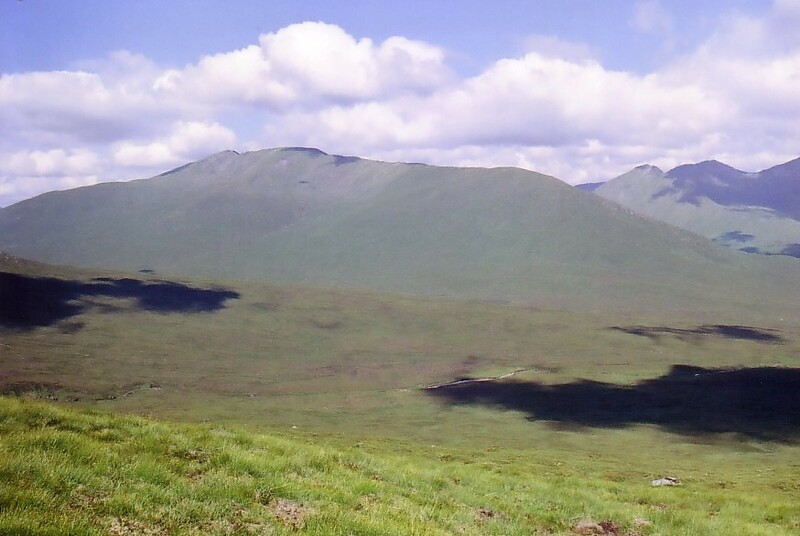 I try to avoid the Western Highlands in heat wave conditions due to the clegs midges and humidity. 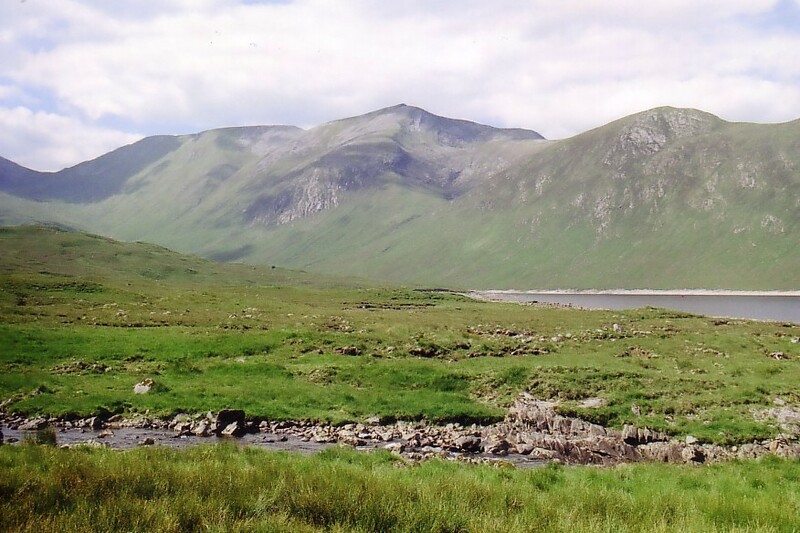 Read an article in the latest Scottish Mountaineer mag that the folk that live in Glen Etive are so fed up with rubbish and abandoned tents every summer in that glen, where wild camping is allowed, that they are suggesting it be a private road where you would have to walk in to camp. 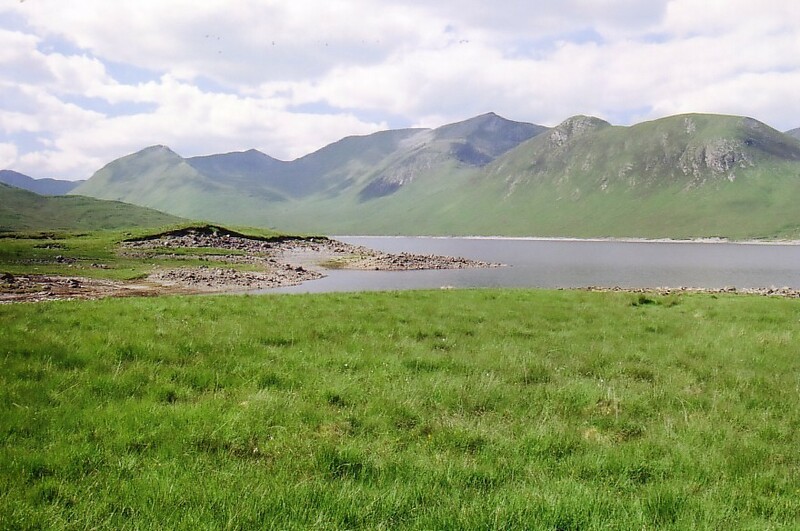 (The photos of the mountains of junk left behind are pretty bad and they get left to clean it up) I’m well behind the times as I still remember Glen Etive as a beautiful remote area with only a few tents belonging to genuine outdoor folk..
Also in another article in S.M. human waste is a growing problem in the outdoors with the recommended method being you should carry any waste produced back out again in a bag. Changed times since the carefree days when all you needed was a small trowel or a spade. 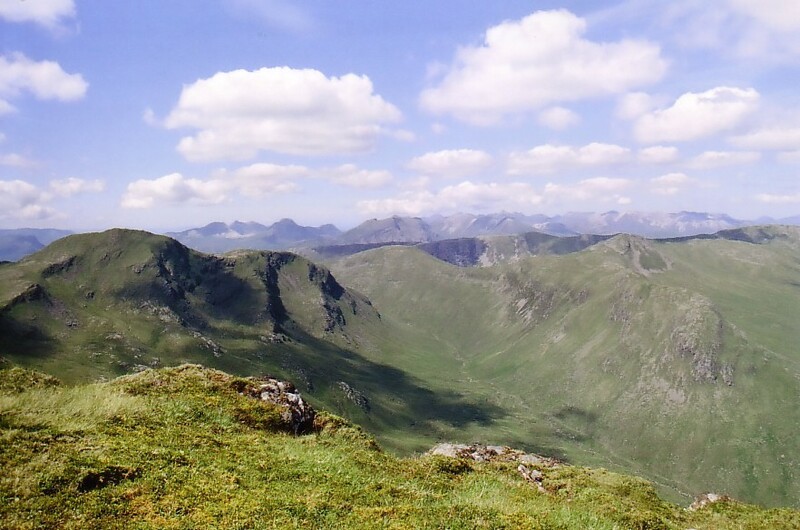 Maybe you are completing your Munro adventure at the right time.. while its still wild and unrestricted. 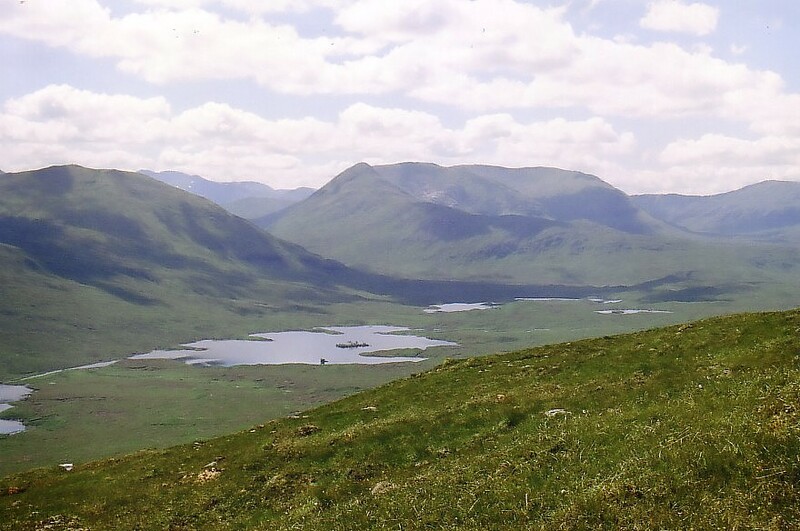 There certainly are a lot of campers down Glen Etive – last time I was there (when it ate my car 😦 ), there were campers the whole way down the glen. Some of them would be hill people and probably cleared up afterwards, but there were some quite large, uncontrolled-looking fires with groups of folks around them drinking lots of cans who didn’t look so good really. Down the end, by the beautiful loch, seems to have turned into an unofficial campsite and I wasn’t so sure about the look of many of the folk camped down there either – although I might be being harsh and they were possibly all okay. It was the middle of the day and I was just taking photos so I didn’t get to see what was left at the end of their camping. Wow! Looks a magical place! 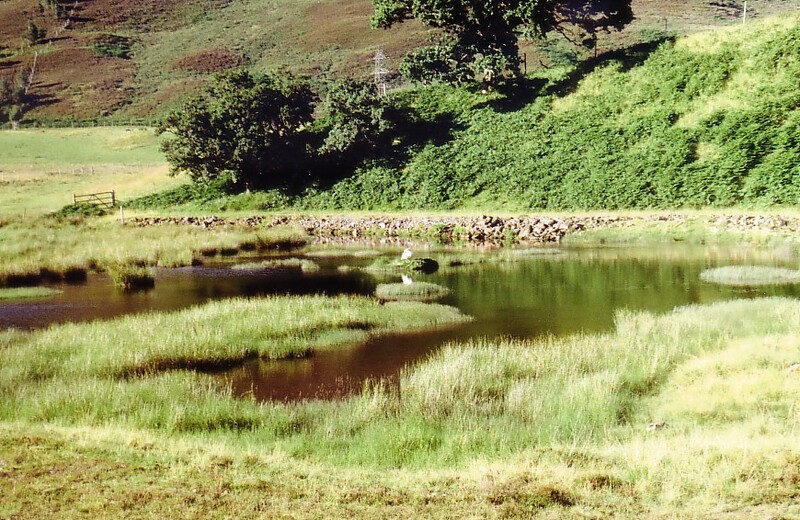 THere has been a great deal of hot weather in Scotland the past few summers. It’s been very hot each July but that’s been the only good weather I’ve had up there really – same as here I think. Hasn’t August been cold?